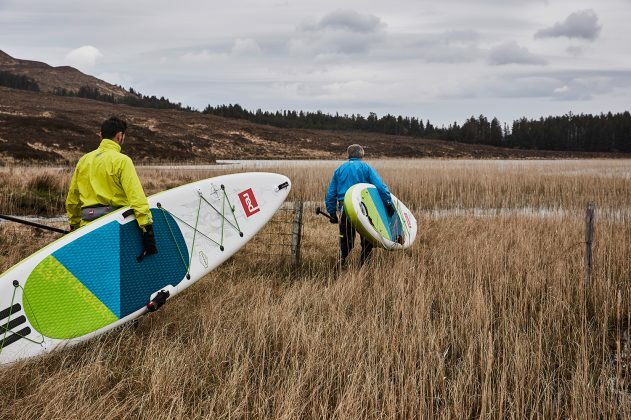 Run to the hills with Phil Grundy and Simon Cole as they take it back to basics with a paddle boarding adventure on Scotland’s breath-taking Isle of Skye. ‘I’ve got one!’ roars Simon, his head cresting the clear water. He’s triumphantly waving his hand, in which he’s holding a spectacular scallop shell. ‘Look at the size of this beauty. It’s huge! We’re not going hungry tonight. And there are loads more of them down there!’ He promptly swims over to Phil, who is creating a makeshift raft out of two Red Paddle Co Voyager boards. 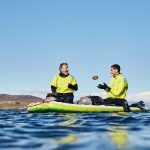 As Simon clambers up, he tosses over the shellfish for his friend to inspect while he catches his breath and prepares to dive back down. 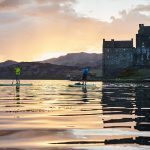 The pair are floating in the middle of a giant sea loch surrounded by formidable-looking hills to the east of the Isle of Skye in Scotland, which feels about as far from civilisation as you can get. There’s not a soul in sight, and the high sun is piercing the blue salt water that’s famed for its clarity and abundance of seafood. 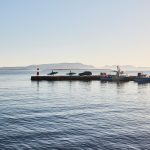 Scallops from here are a particularly prized delicacy and get shipped out to customers all over the world. 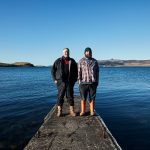 The leading masters in the game are the father and son team from Sconser Scallops with over 30 years of experience farming and ranching scallops, who gave Phil and Simon a few words of wisdom on the shore before their mini diving adventure. 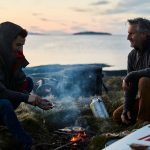 If truth be told, there was never any real risk that the duo would go without dinner because there’s a Michelin-starred restaurant not 20 minutes away that serves local specialities. However, they’re on a mission to get back to basics on this trip, and free-diving for dinner was top of the list. ‘The adventure began on the drive up, after we left behind the motorway in Glasgow,’ says Phil. 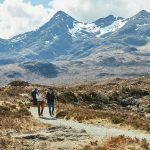 ‘We wanted to come to Skye because it’s the ultimate destination for nature lovers,’ Phil adds. ‘It has the most gorgeous landscape and spectacular views. 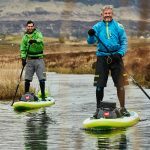 The locals are really friendly, and you can paddleboard everywhere – there’s nowhere better for an activity like this, in my opinion.’ Later, Simon and Phil take a hike into the foothills of the Black Cuillin mountain, via the old military bridge in Sligachan. 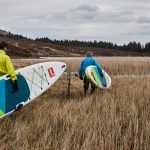 With their boards on their backs, they follow the path up to its snow-capped peak, admiring the views and soaring eagles en route. 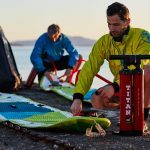 The following day, more water-based adventures await starting with a crack-of-dawn sunrise paddle from the jetty at Broadford. 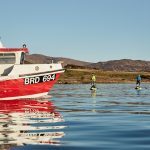 Greeted by a smattering of weathered local fishermen, full of energy and preparing for their working day ahead, Simon and Phil paddle off on the glassy still morning waters without another soul on the water yet. Returning to dry land even before the rest of the island is even up, they fill up on a hearty Scottish breakfast in a local cafe, haggis included of course before setting off to explore more of the magical island. 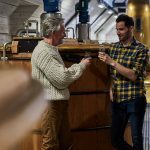 As the weather changes and the rain comes in the pair head indoors for a tour of the new Torabhaig Distillery – the perfect place to learn about the craft of whisky-making (and select a Scotch to enjoy after dinner). Torabhaig is the second ever licensed Single Malt Scotch Whisky distillery on the Isle of Skye and a beautiful place to have a wee-dram.